Objective To evaluate the effectiveness of a structured education pulmonary rehabilitation programme on the health status of people with chronic obstructive pulmonary disease (COPD). Design Two-arm, cluster randomised controlled trial. Setting 32 general practices in the Republic of Ireland. Participants 350 participants with a diagnosis of moderate or severe COPD. Intervention Experimental group received a structured education pulmonary rehabilitation programme, delivered by the practice nurse and physiotherapist. Control group received usual care. Main outcome measure Health status as measured by the Chronic Respiratory Questionnaire (CRQ) at baseline and at 12–14 weeks postcompletion of the programme. Results Participants allocated to the intervention group had statistically significant higher mean change total CRQ scores (adjusted mean difference (MD) 1.11, 95% CI 0.35 to 1.87). However, the CI does not exclude a smaller difference than the one that was prespecified as clinically important. Participants allocated to the intervention group also had statistically significant higher mean CRQ Dyspnoea scores after intervention (adjusted MD 0.49, 95% CI 0.20 to 0.78) and CRQ Physical scores (adjusted MD 0.37, 95% CI 0.14 to 0.60). However, CIs for both the CRQ Dyspnoea and CRQ Physical subscales do not exclude smaller differences as prespecified as clinically important. No other statistically significant differences between groups were seen. Conclusions A primary care based structured education pulmonary rehabilitation programme is feasible and may increase local accessibility to people with moderate and severe COPD. What is the effectiveness of a structured education pulmonary rehabilitation programme delivered at the level of the general practice on the health status of people with moderate chronic obstructive pulmonary disease (COPD)? Participants allocated to a primary care based structured education pulmonary rehabilitation programme had statistically significant higher mean Chronic Respiratory Questionnaire Total, Dyspnoea and Physical scores. However, CIs do not exclude a smaller difference than those prespecified as clinically important. This study demonstrates that a primary care based structured education pulmonary rehabilitation programme is feasible and may increase local accessibility to people with moderate and severe COPD. A key recommendation in the treatment of chronic obstructive pulmonary disease (COPD) is the use of pulmonary rehabilitation programmes (PRPs)1 focusing on self-management techniques. These have been found to improve COPD patients’ dyspnoea and health related quality of life.2––4 Furthermore, programmes adhering to the principles of structured education are more effective in promoting self-management in chronic conditions than unstructured programmes.5 Structured education programmes differ from conventional educational programmes in that they are underpinned by key criteria (online supplementary file 1). However, few PRPs adhere to the key criteria of structured education. Furthermore, PRPs are predominantly hospital based with long waiting lists6 with limited access for general practitioners (GPs) and their patients. There is a lack of research to support the effectiveness of PRPs and in particular the effectiveness of structured education PRPs (SEPRP). We carried out a single-blind, cluster randomised controlled trial to evaluate the effectiveness of a SEPRP, delivered at the level of the general practice, on the health status of people with COPD. The trial methods have been reported previously.7 GP practices were eligible to participate if they used a computerised medication recording system, employed a practice nurse and had a client population >2500 people. Participants were identified from the patient's medical records using a patient eligibility identification algorithm (figure 1). Potential participants were invited for spirometry testing and those with moderate to severe COPD, as defined by Global Initiative for Chronic Lung Disease (GOLD),8 were invited to participate. 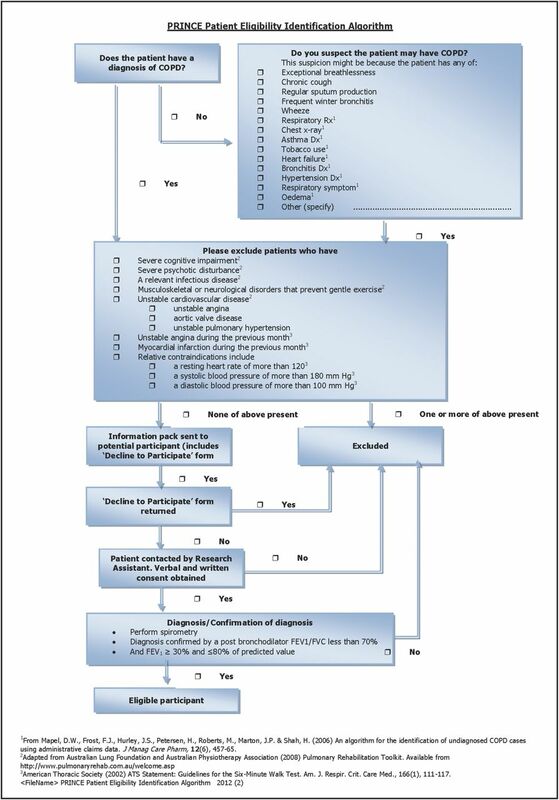 Patient eligibility identification algorithm. Access the article online to view this figure in colour. The primary outcome was the total score of the disease specific quality of life instrument, the Chronic Respiratory Questionnaire (CRQ).9 This instrument consists of 20 items across four domains: dyspnoea (five items), fatigue (four items), emotional function (seven items) and mastery (four items). Higher scores represent less impairment in quality of life domains. Secondary outcomes were the incremental shuttle walk test (ISWT) and the self-efficacy for managing chronic disease 6-Item scale.10 EuroQol EQ-5D11 and utilisation of healthcare services data were also collected which will be reported separately. We chose a cluster randomised design to minimise the risk that the SEPRP delivered by the practice team to the experimental group might influence the care they provided to control group participants. Group allocation concealment was achieved by giving responsibility for computerised allocation sequence generation and group allocation to a researcher independent of the research team and blinded to baseline outcome data. To minimise time delay and patient attrition, practices were randomised to control or intervention groups in four groups of eligible practices on a 1:1 ratio. Due to the participative nature of the SEPRP, it was not possible to blind either participants or practices to their group allocation. Participants allocated to the intervention received the SEPRP while those allocated to the control group received usual care. The development of SEPRP is described in detail elsewhere12 and the contents of SEPRP are outlined in the online supplementary file 2. We undertook a descriptive qualitative study interviewing GPs, practice nurses and participants allocated to the control group to describe ‘usual care’. This revealed that participants with COPD attended their GP when they felt unwell and were prescribed medications. Most did not receive advice on exercising or breathing techniques and few had any real understanding of COPD. Research assistants trained in outcome assessment, blinded to group allocation, collected data 12–14 weeks after the programme. The research assistants entering and performing data analyses were blinded to group allocation. We used single data entry with visual verification on a predetermined random sample of records from the data set determined using a continuous sampling plan (CSP-1).13 We reviewed full data entry records for 81 participants (23.1%) consisting of 40 720 items of which 42 were inaccurate for an outgoing accuracy rate of 99.9%. We used methods for standard sample size estimates for trials that randomised at the level of the individual and adjusted for clustering by inflating sample size estimates by the design effect of 1+(m − 1)ρ (m average cluster size, and ρ estimated intraclass correlation coefficient (ICC)).14 The sample size was based on the mean difference (MD) between intervention and control groups in the total CRQ (primary outcome) for which the minimal clinically important difference (MCID) had been identified in the literature as 0.515 with an estimated SD of 1.145.16 Using the above values and an ICC of 0.05 based on studies involving older persons in primary care,17 32 practices each with a minimum of 10 participants were required for power of at least 80% with an α level of 0.05. This calculation allowed for a loss of 20% of participants and of four general practices. Statistical analyses are reported according to the CONSORT guidelines.18 We performed an intention to treat analysis using multiple imputation based on chained equations to impute missing data. We used a linear mixed model with a cluster specific random effect to estimate and test the effect of the intervention for all continuous primary and secondary responses19 separately to account for similarity between the patients within each cluster. We also investigated cluster specific baseline adjustments.20 Responses at baseline were included as a covariate. A comparison of the results between (i) maximal models where all available covariates were included to correct for age, gender, BMI, smoking history and current smoking status, spirometry results and wider medical history and (ii) the most parsimonious set of predictors chosen using variable selection techniques (ie, stepwise selection and best subsets) was performed. No substantial difference in conclusions was found, so the parsimonious model results are presented below. We used Minitab 16 and R (2.10) to conduct the analysis. The flow of practices and individual participants through random assignment, receiving allocated intervention, loss to follow-up and analysed for the primary outcome of Total CRQ is presented in figure 2. Flow of participants and practices through trial. Access the article online to view this figure in colour. Recruitment of practices and participants took 15 months (February 2009–May 2010). We screened 259 practices for eligibility of which 227 were excluded (142 did not meet the inclusion criteria and 85 declined to participate). Practices that declined participation did not provide specific details on practice characteristics. Reasons given for declining included pressure of work, disinterest, maternity leave and staff sickness. Participating practices were similar in terms of practice size, number of GPs/practice nurses and were representative of national practices identified by Kavanagh et al.21 We screened 1146 potential patient participants for eligibility of which 615 were excluded prior to randomisation (564 did not meet spirometry inclusion criteria and 51 were excluded on other medical grounds). A further 100 eligible participants were excluded prior to randomisation because the practices they were attending had insufficient numbers of participating patients and were therefore excluded. Of the remaining 431 participants, 350 attended for baseline assessment and were subsequently randomised. We assigned 32 practices with 350 participants randomly to intervention (16 practices, 178 participants) and control (16 practices, 172 participants). Table 1 shows the characteristics of the cluster and demographic and clinical characteristics of participants at baseline. The ratio of male to female participants was approximately 2:1 and the majority of participants were married or living with their partner, had free medical care eligibilityi and were retired. Coexisting medical disease was common and approximately a third of participants were current smokers (table 1). The median number of participants in each intervention and control cluster was 11 (range 8–14) and 10 (range 9–14), respectively. Due to lack of staff, which was exacerbated by a H1N1 outbreak, one cluster with 10 participants assigned to the intervention withdrew prior to participants receiving the SEPRP. Of the remaining 168 participants, 23 (14%) did not attend any education session, 28 (17%) attended 1–3 sessions, 21 (12%) attended 4–5 sessions and 96 (57%) attended 6–8 sessions. Illness and hospitalisation was the most common reason given for non-attendance (n=62, 37%). Other reasons included working (n=16, 10%), holidays (n=7, 4%), family illness (n=7, 4%) and disinterest (n=14, 8%). In all, 35 of the 178 participants (19.7%) allocated to the intervention and 38 of the 172 allocated to the control groups (22.1%) did not complete the CRQ (figure 2). Table 2 presents data on outcomes prior to the intervention and at 12–14 weeks after completion of the SEPRP. Compared with participants in the control group, those allocated to the intervention had significantly higher CRQ Total (p=0.006), Dyspnoea (p=0.04), Emotional (p=0.06), Physical (p=0.013) and Psychological (p=0.03) baseline scores. Hence, correction for the baseline values was needed to ensure no allocation or covariate bias on the estimated effects. Participants allocated to the intervention had statistically significant higher mean change total CRQ scores. However, the CI for the total CRQ score difference does not exclude a smaller difference than the one that was prespecified as clinically important. Using methods described by Guyatt et al22 we calculated the number needed to treat (NNT) for the Total CRQ as 7. Participants allocated to the intervention also had statistically significant higher mean CRQ Dyspnoea scores after intervention and CRQ Physical scores. However, as with total CRQ scores, CIs for differences in mean change scores for the CRQ Dyspnoea and CRQ Physical subscales do not exclude smaller differences as prespecified as clinically important. The NNT for CRQ Dyspnoea is 5.5. There was no statistically significant difference between groups in all other secondary outcomes (table 2). Results are consistent when missing values are ignored or when multiple imputation was used, when correcting for all covariates and when a subset of the best predictors are chosen using variable selection. For the CRQ response variables, there was little evidence of any substantial cluster effect. We explored intervention effects for participants who had attended all (100%, n=8), 1%–49% (n=2–3) and 50%–99% (n=4–7) of education sessions. Intervention effects were consistent with overall affects for those who had attended all (MD 0.59, 95% CI 0.13 to 1.06) and 50%–99% (MD 0.61, 95% CI 0.21 to 1.01) of sessions but not for those who attended 1%–49% of sessions (MD 0.37, 95% CI −0.30 to 0.97). There were two minor adverse events; one when a participant experienced shortness of breath undertaking the ISWT at baseline outcome assessment, and the second occurred when another participant on arrival at an intervention session complained of chest pain. Both participants were immediately referred to their respective GPs and both had uneventful recoveries. There were no other adverse events recorded. We demonstrate that a 22–24-week complex intervention (SEPRP) targeted at improving the health status of persons with moderate to severe COPD results in a statistically significant improvement of total CRQ scores. However, the CIs for the total CRQ change scores and the CRQ Dyspnoea and CRQ Physical subscale change scores do not exclude a smaller difference than the one that was prespecified as clinically important. The NNT for an additional beneficial outcome in the Total CRQ is 7 and for CRQ Dyspnoea the NNT is 5.5. These NNT values could be attractive to clinicians, people with COPD and funders. Importantly, referring seven patients per year to PRP such as that offered in this study can be expected to yield, on average, additional improvement at 12–14 weeks. In contrast with most of the trials included in the Cochrane systematic review,3 most participants in our study had moderate COPD (forced expiratory volume in 1 s (FEV1) around 55%–60% predicted). This might be an important factor determining the absence of a clinically significant treatment effect. Although the changes in the ISWT and self-efficacy measures in the intervention demonstrate improvements there was no statistically significant difference between groups. This lack of change in the ISWT appears to be consistent with more recent literature, which queries the responsiveness of ISWT to capture improvements in exercise tolerance following exercise interventions in persons with COPD.23 The lack of change in self-efficacy is unclear, but it may be that receiving a diagnosis of COPD and learning more about the condition as participants progressed through the SEPRP may have inadvertently led to lower scores in self-efficacy, not because behaviour change had not occurred but because participants were more aware of the condition and how it impacted on their lives relative to baseline. This is one of the largest trials evaluating the effects of PRPs for people with COPD. The Cochrane review of PR versus standard care by Lacasse et al3 includes 31 trials of which the largest includes 200 randomised participants24 while the smallest includes 14.25 Furthermore, the majority of PRPs in the Cochrane review were conducted in outpatient departments (n=15), home based (n=9), inpatient (n=3), house bound (n=1) or involved a combination of inpatient and home based (n=1) or outpatient and home based (n=1). Only one programme was delivered in the community.26 This study26 reported statistically significant improvements in exercise and quality of life outcomes for PRP, which included drug therapy compared with drug therapy alone. This was a small cross over trial conducted in eight physiotherapy practices and study participants were patients with asthma (n=43) and COPD (n=23). Waterhouse et al27 randomised 240 patients to community or hospital based PRP and found that community based PRP has similar efficacy to hospital based programmes. However, unlike our study there was no usual care arm and the intervention was delivered in both settings by the same hospital physiotherapy team. Accessibility to PRPs is a well recognised international problem28 and until recently most programmes were hospital based. Exploring the potential effectiveness therefore of PRPs delivered in alternative clinical settings as we have done is crucial. Many of the hospital based PRPs use expensive equipment and are delivered by respiratory specialists. We used inexpensive equipment and trained practice nurses and physiotherapists with no prior COPD expertise to facilitate a PRP in primary care. The inclusion of PRINCE in the Cochrane review strengthens the findings of the review and increases its power but does not result in changing the direction or statistical significance of CRQ domain outcomes. However, as most trials included in the review3 were hospital or home based, the inclusion of our findings might best be considered in the update of the review by Lacasse et al3 (currently underway by some of the authors) and also that subgroup analyses by programme setting (ie, community based vs acute/hospital based) be considered within this review. We randomised participants to control and intervention following the collection of baseline data and the demographic data indicated that both groups were well matched. There was no feasible way to blind the intervention group to participants or to those facilitating the programme and our study is open to a risk of performance bias. Nevertheless, outcome assessment was blinded thus minimising risks to detection bias. Rehabilitation studies usually perform assessment measures immediately after completion of the intervention in addition to longer term outcomes to differentiate between the effect of the intervention and the impact of maintenance. Unfortunately, budgetary constraints only allowed one round of postoutcome data collection after completion of the intervention. There were 16 different teams (a practice nurse and a physiotherapist from each intervention practice) delivering the SEPRP. Although we provided intensive training, created a detailed programme manual and implemented quality control measures (see online supplementary file 3), it is not known if the intervention was always delivered consistently. However, we felt that this approach ensured that the knowledge gained remained within primary care potentially having a more lasting impact. We excluded participants with very severe COPD due to concerns for their safety and health risks. Of the 1146 patients screened for eligibility, 350 were randomised. This is not unusual for trials, in which obtaining a homogenous sample is prioritised and in general practice where disease coding may be pragmatic. Indeed, Waterhouse et al27 eventually randomised 326 patients from 1041 potentially eligible patients. Further work is also needed to delineate the factors that contribute or hinder the ability of people to maintain improvements over time. In conclusion, physiotherapists and practice nurses who have no prior COPD expertise can be trained to deliver a SEPRP to people with moderate and severe COPD, thereby increasing local accessibility. However, the CIs for the total CRQ change scores and the CRQ Dyspnoea and CRQ Physical subscale change scores do not exclude a smaller difference than the one that was prespecified as clinically important. This research was supported by the Health Research Board, Ireland, and by a Pfizer Unconditional Educational Grant. The authors would like to acknowledge Joan Kavanagh, Recruitment Manager. Most especially, we would like to thank the people with COPD who chose to join this study, the practice nurses and physiotherapists for enthusiastically taking on the role of providing the structured education pulmonary rehabilitation programme and the general practitioners for supporting the study. We would also like to thank the research assistants, Eimear Burke, Denise Healy, Eiginta Vitienne and Jill Murphy and data inputters Roisin Ui Chiardha, Stella Kennedy and Caoimhe Ui Chiardha. Finally, we would like to acknowledge the assistance and advice provided by the members of the Steering and Advisory Groups for their continued support and guidance.
. American Thoraic Society/European Respiratory Society statement on pulmonary rehabilitation. AM J Respir Crit Care Med 2006;173:1390–413.
. Pulmonary rehabilitation in chronic obstructive pulmonary disease. AM J Respir Crit Care Med 2005;172:19–38.
. Pulmonary rehabilitation for chronic obstructive pulmonary disease. Cochrane Database Syst Rev 2006 (4):49. CD003793.
. Self-management education for patients with chronic obstructive pulmonary disease. Cochrane Database Syst Rev 2007;(4):CD002990. National Institute for Health and Clinical Excellence. Guidance on the use of patient education models for diabetes. Technology Appraisal Guidance 60. NICE, 2003.
, ed. EFA book on chronic obstructive pulmonary disease in Europe: sharing and caring. Brussels: European Federation of Allergy and Airways Disease, 2009. http://www.efanet.org/documents/EFACOPDBook.pdf (accessed 21 Jan 2013).
. A cluster randomised controlled trial evaluating the effectiveness of a structured pulmonary rehabilitation education programme for improving the health status of people with chronic obstructive pulmonary disease (COPD): The PRINCE Study Protocol. BMC Pulm Med 2011;11. http://www.biomedcentral.com/1471-2466/11/4 (accessed 12 Jan 2012). Global Initiative for Chronic Obstructive Lung Disease (GOLD). Global Strategy for Diagnosis, Management and Prevention of COPD: Update 2008. http://www.goldcopd.org (accessed 21 Sep 2012).
. Effect of a self-management program on patients with chronic disease. Eff Clin Pract 2001;4:256–62.
. Developing a structured education programme for clients with COPD. Br J Community Nurs 2011;16:231–7.
. A quantifiable alternative to double data entry. Control Clin Trials 2000;21:94–102.
. Randomization by cluster. Sample size requirements and analysis. Am J Epidemiol 1981;114:906–14.
. Development of a self-reported Chronic Respiratory Questionnaire (CRQ-SR). Thorax 2001;56:954–9.
. Intraclass correlation coefficients for cluster randomized trials in primary care: data from the MRC Trial of the Assessment and Management of Older People in the Community. Control Clin Trials 2002;23:409–21.
. CONSORT statement: extension to cluster randomised trials. BMJ 2004;328:702–8.
. Longitudinal data analysis. New York: Wiley, 2006.
. Methods for modelling change in cluster randomization trials. Stat Med 2004;23:2341–57.
. WestREN: a description of an Irish academic general practice research network. BMC Fam Pract 2010;11:74.
. Responsiveness of various exercise-testing protocols to therapeutic interventions in COPD. Pulm Med 2013;2013:410748.
. Results at 1 year of outpatient multidisciplinary pulmonary rehabilitation: a randomised controlled trial. Lancet 2000;355:362–8.
. Effects of a supervised home exercise program on patients with severe chronic obstructive pulmonary disease. Phys Ther 1988;68:469–74.
. The effects of a community-based pulmonary rehabilitation programme on exercise tolerance and quality of life: a randomized controlled trial. 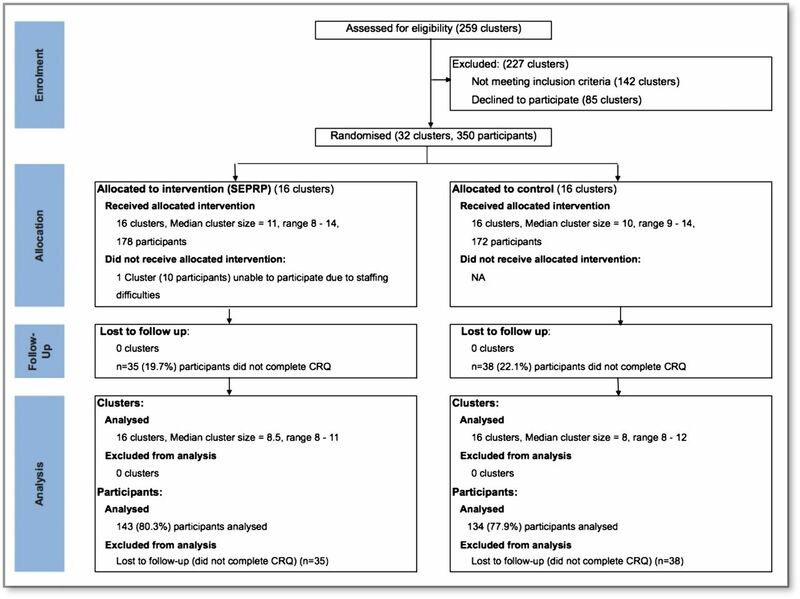 Eur Respir J 1997;10:104–13.
. A randomised 2×2 trial of community versus hospital pulmonary rehabilitation, followed by telephone or conventional follow-up. Health Technol Assessment 2010;14:i–v, vii–xi, 1–140.
. Making pulmonary rehabilitation a success in COPD. Swiss Med Wkly 2010;140:w13067.
. Putting research into context-revisited. Lancet 2010;376:10–11.
. Seven-year time course of lung function, symptoms, health-related quality of life, and exercise tolerance in COPD patients undergoing pulmonary rehabilitation programs. Respir Med 2007;101:1961–70. Correction notice This article has been corrected since it was published Online First. The list of Contributors has been updated. Collaborators Dr. Maura Dowling, Dr Mitra Shahidi, Dr David Shaw, Dr Thomas Kropman, Professor Anthony O' Regan, Ms Agnes Tully, Ms Yvonne Conway, Dr Michelle Glacken and Ms Catherine Meagher. Contributors Dympna Casey and Kathy Murphy led the idea for the trial, identified the data collection tools, monitored data collection, oversaw the delivery of the structured education programme for the entire trial, and drafted the research proposal to secure funding. Dympna is guarantor. Evelyn Byrne and Brona Mooney assisted in the collection of data for the trial. Robert Gawley and Niamh Duignan helped design the physical exercise component of the structured education programme. Irene O Byrne provided smoking cessation advice to participants as required. Michelle Agnew and Mitra Shahidi helped design the training programme for the spirometery testing and ensured that stringent principles were adhered to in the conduct and interpretation of spirometery testing throughout the trial. Ruth Taylor helped design the structured education programme and in particular helped to identify appropriate and relevant content. Magurite O'Donnell helped develop the dietary component of the structured education programme. Margaret McGrath and Michael Mcgloin reviewed and helped edit the structured education programme to ensure suitability for persons with COPD. Maire O Connor helped ensure that best practice guidelines and policies regarding COPD were included and implemented in the structured education programme. Ms Karen King was the initial project manager. Funding Funded by the Health Research Board, Ireland and by an unconditional educational grant from Pfizer (grant number NMRPS/2007/1). Competing interests All authors have completed the Unified Competing Interests form at http://www.icmje.org/coi_disclosure.pdf (available on request from the corresponding author) and declare: that a research grant from the Health Research Board, Ireland, was received to undertake the study, and an unconditional Educational Grant was obtained from Pfizer which provided support services to cover desktop publication costs for manuals and support for spirometery. All authors declare no financial relationships with any organisations that might have an interest in the submitted work in the previous 3 years and no other relationships or activities that could appear to have influenced the submitted work. All authors, external and internal, had full access to all of the data (including statistical reports and tables) in the study and can take responsibility for the integrity of the data and the accuracy of the data analysis. Ethics approval National University of Ireland Galway and the Irish College of General Practitioners. ↵i Primary care and medications are available free at the point of delivery to a third (approximately) of the population of the Republic of Ireland with the lowest income and therefore ‘free medical care eligibility’ is a direct measure of socio-economic status at the level of the individual. Pulmonary rehabilitation; what's in a name?